It’s really annoying to find unwanted multiple contacts on iPhone. However, deleting contacts individually from your iPhone will take a long time since there’s no multi-delete option in Contacts on iPhone. Therefore, it is necessary to find ways to quickly delete multiple contacts on iPhone. 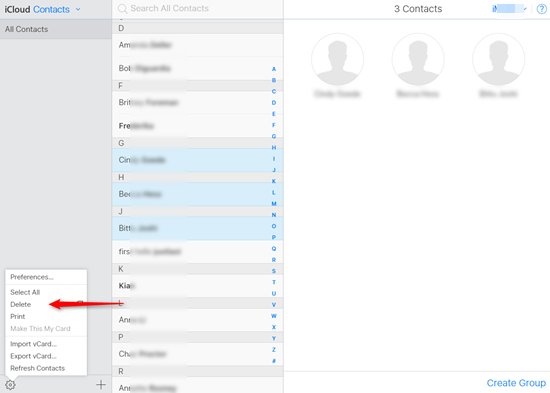 Here are three solutions to mass deleted contacts from iPhone or iPad at once. Step 1: Launch this app and tap “All Contacts”. Step 2: Tap the “edit” icon and then choose the contacts you want to delete. Step 3: Tap the Trash icon to delete the contacts you have chosen. You can also merge the duplicate contacts to easily clean up your address book! Go to System Preferences > iCloud on your Mac. Sign in the same Apple ID as that on your iPhone/iPad. Check “Contacts” so that your iOS contacts will be synced onto Mac. Go to Applications > Contacts on your Mac, you will able to view all the contacts saved on your iPhone/iPad. Viewing All Contacts, hold down the Command button on your keyboard and click as many contacts as you want. 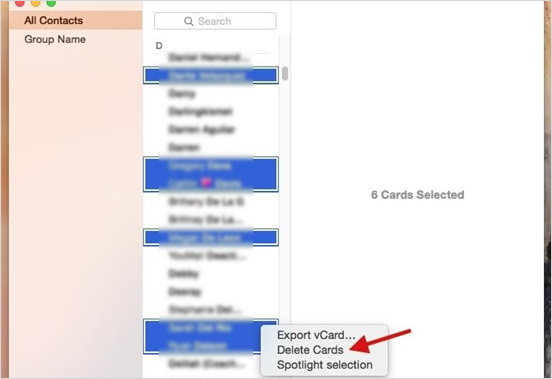 Right click and click “Delete Cards” to delete them at once. All the changes of your contacts on Mac will be synced with your iPhone/iPad automatically. Go to icloud.com on your computer and sign in with your iPhone Apple ID. Select “Contacts”, hold “Ctrl” key and click on the contacts you want to delete. Press the Delete key on your keyboard and confirm Delete. This method also applies to a Mac. If you accidentally deleted contacts you don’t want to lose, you can recover deleted contacts on iPhone/iPad using different methods.